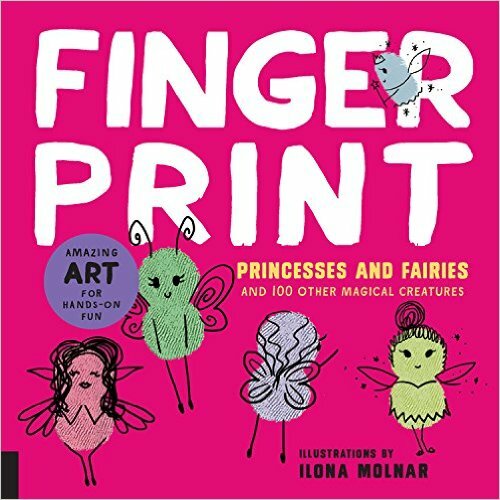 Take a hands-on approach to art with Fingerprint Princesses and Fairies! While fingerprint art isn’t a new concept to our family, Brooke is now ready to take this creative art to a new level with the help of a fun new book by Quarry Books called Fingerprint Princesses and Fairies. We both love art books that give us step-by-step instruction and this book provides 30 different techniques on how to create fairytale characters ranging from princesses to butterflies all with your own fingerprints.This is a fun and engaging art activity you can do easily at home or the classroom and all your need is at least one stamp pad. Fingerprint Art is fun for all ages and this is a very hands-on approach to art just by using your own unique touch of your fingertips. While you can use the pages in this paperback to hone your fingerprint art, you can perfect and use your new craft on any paper, art journal, or doodle. We have learned that the world of fingerprint art is limitless! We have enjoyed making our own fingerprint enchanted world and while it can be a little messy, there is no paintbrush required. Remember, creativity is ALWAYS at your fingertips! Want more fingerprint art books? 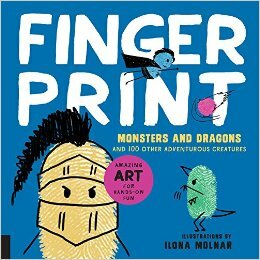 Fingerprint Monsters and Dragons: and 100 Other Adventurous Creatures (Fingerprint Art) is also available for purchase through Quarry Books by the same authors/illustrators. Here is the link to the Amazon Prime purchase page where the book is currently on sale for $13.21. About the Authors/Illustrators: Ilona Molnar is a illustrator based in Munich Germany. Natahsa Mossbauer and Silvia Keller are both editors working for Editions Michael Fisher a Munich-based art and lifestyle publisher. About Quarry Books: An offshoot of Rockport Publishers, Quarry Books (Beverly, MA) was started in 1997 to extend Rockport Publishers’ business to a non-professional audience. Dedicated to providing instruction and inspiration to creative makers everywhere, Quarry Books offers authoritative, beautifully designed and illustrated inspiration and reference books for a wide range of enthusiasts including artists, illustrators, crafters, and cooks on subjects ranging from beekeeping and bread making to dog training and doll making.